As gym memberships are becoming more expensive and home exercise equipment is becoming more affordable, many people are deciding to workout in the comfort of their own home. Some of the benefits of exercising at home are, first of all, not having to commute to the gym. Commuting back and forth to the gym can take up to an hour per gym session. Secondly, gyms can be smelly and sweaty environments. And last of all, gym memberships can be a pricey monthly or yearly expenditure. Therefore, home workouts are more convenient, more comfortable and cheaper overall. There are many different types of exercise equipment made in a compact design, that will take up very little space in smaller homes. And many of these exercise machines can be folded up to half their size, making storage very convenient. In this article, Best Home Exercise Equipment For Small Spaces, we will be looking at the top fitness equipment, suitable for small homes. Each of these machines will be compact, portable or foldable, and will be ideal for fitting into small areas. Treadmills are a very popular style of exercise machine, allowing you to walk, jog or run indoors. If you have ever experienced a gym treadmill, you will know that they are quite large. In fact, some treadmills will take up the same space as a twin size bed. Fortunately, there are excellent quality compact sized treadmills available, that can also be folded up when not in use. These small treadmills are the perfect space saver and do not need a huge amount of space to use and can be stored away up against a wall when not in use. Click on the link if you would like to see a list of our favorite compact, folding treadmills. The humble exercise bike was probably the first indoor cardio exercise machine ever made. It has stood the test of time and remains one of the most popular fitness equipment to this day. Not only are regular upright exercise bikes small enough to fit into the smallest of rooms, but modern bikes are now even more compact. For extra easy storage there are many bikes available that have the foldaway feature, meaning they have a tiny footprint when not in use. Some of the largest exercise bikes on the market are recumbent bikes. 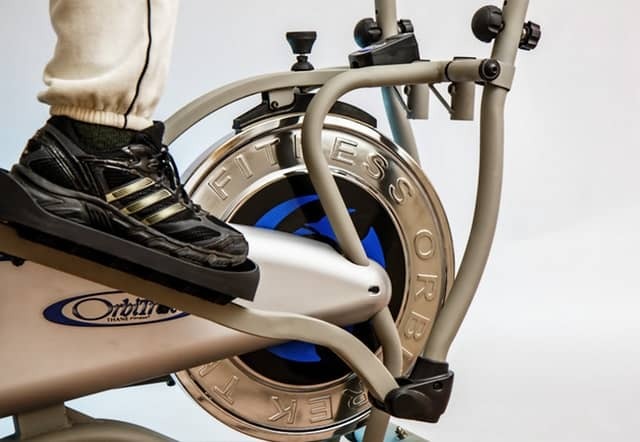 However, recumbent bikes are a little more comfortable to use, therefore in this article on the best exercise bikes for small spaces, we chose a variety of styles of exercise bikes to review. Elliptical machines are one of the newer types of exercise equipment on the market. They are a type of hybrid machine that mix cycling, running and climbing. They work more muscle groups compared to treadmills and bikes and can provide a full body workout. Due to the fact that the design of this machine is more vertical than horizontal, it is an excellent choice for small spaces and will not have a big footprint in small homes. To have a look at these compact elliptical machine reviews, click on the link. Rowing machines can give a very challenging workout and because they provide full body exercise with many muscles used, they are a wonderful choice for home exercise equipment. A rowing machine will target the legs, glutes, back and biceps. Although they can be long in size, they are also usually quite narrow. A nice feature that some rowing machines have is the folding feature. The rowing machine can be folded up and stored away until the next workout. These compact rowing machines are both lightweight and portable. Platform vibration machines work by making muscles contract. These contractions will over time strengthen, tone and develop the muscles throughout the body. It really is a passive way of exercising and can be a relaxing way of tightening and toning the body. Many platform vibration machines are compact and have a very small footprint. How about using your own bodyweight with the aid of the TRX system to give a full body workout at home. The TRX suspension gear is anchored to the closed door in any room in your house and then exercises involving all of the muscle groups in your body can be performed. Depending on your fitness level, this workout can be very challenging, however the TRX Training System caters to all fitness levels. The beauty of the TRX is that it can be folded up and stored in a small bag. It is ideal for small spaces and an excellent storage solution for small homes. If you are looking for more strength training rather than cardio exercise, then the TRX is a great choice. Stepping machines are compact, portable and a very convenient way to get a good cardio workout in a small area. When working out, a stepper machine won’t take up much more space than your own body size, and are small enough to be stored in a closet or under a bed. These compact exercise machines are great for a challenging lower body workout. Stepping machines will not only give a good cardio workout but will also develop the leg and glute muscles. Why not take a journey back to your childhood and get fit and healthy on a mini trampoline. Bouncing is not only for kids though, it can be just as fun for adults and it is great way to raise your heart beat. Jumping on a mini trampoline is not only great as a cardiovascular workout, but it is also very low impact, meaning it is easy on the joints. What is more, mini trampolines are pretty small and also come in the folding variety, allowing you to workout in a small area and store the trampoline neatly away when finished. Why not check out these mini trampolines reviews to see if they are the type of exercise equipment you would be interested in. The two most important questions to ask yourself when buying home exercise equipment is what do you want the exercise machine for and where are you going to put it. If you are looking for an exercise machine purely for cardio reasons, then you may want to consider a treadmill or an exercise bike. However, if you want to develop your muscles as well, then the TRX Suspension System may be a great choice for you. If you are looking for a full body workout, then an elliptical machine or a rowing machine is a suitable choice, where as a stepping machine concentrates more on the lower body. Your choice of exercise equipment should also depend on the size of the area you will be exercising in. If your free space is very limited, then a trampoline, a stepping machine, a platform vibration machine or the TRX have the smallest footprint. If you have more free space or don’t mind folding the exercise trainer away after each workout, then each of the larger machines above have a foldaway feature. 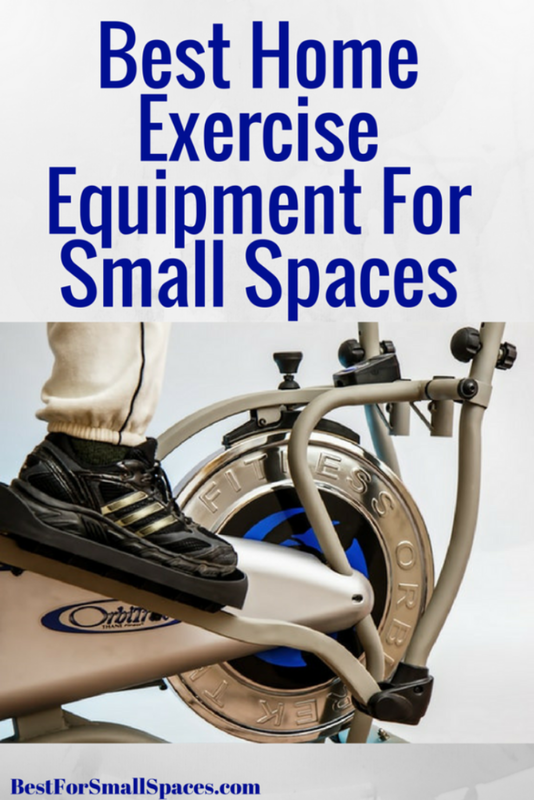 We hope that you found this article on the Best Home Exercise Equipment For Small Spaces helpful. These days, more and more exercise equipment is available to buy in a more compact design and also have a folding feature. Whether you are looking to develop your cardiovascular fitness, increase muscle mass or burn some fat, we hope you found the most suitable piece of exercise equipment for your home.